The S.S. Drake (ドレイク? 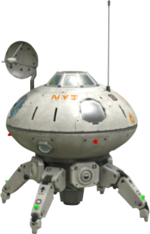 ; SS Drake in the European version), simply referred to from the Koppaites as the Drake, is the main ship in Pikmin 3. It was built by and named after Alph's grandfather. Much like the other ships from the Pikmin series, it serves as the main storage unit for all the gathered objects found by the leaders. Its other purpose is to transport the leaders from place to place. Charlie is its captain and Alph is its engineer. The S.S. Drake in the Garden of Hope. The Drake is very different from the S.S. Dolphin and the Hocotate ship in design, as it appears to be more technologically advanced. The cockpit is also different in that it is capable of holding more people, and may also be used as an access hatch. The Drake has a base from which four legs protrude, containing green lights, a hydraulics system and several other hidden mechanisms. Directly on top of the base is a round body, featuring red lights and several other unique characteristics. It holds the three leaders, has a long antenna attached to the top, and harbors a small satellite from which a blue beam emanates, to help collect and analyze objects. It appears to have a world map on the back side. Several pieces of Koppaite text are written on the outside of the Drake. Soon after the discovery of PNF-404, the Drake was designed and built by Alph's grandfather (also named Drake) exclusively for the heroes' mission. It then picks up Alph, Brittany, and Captain Charlie before initiating a warp-drive sequence to PNF-404. As they arrive at the planet, something goes wrong as the Drake attempts to enter the atmosphere, and it ejects the three occupants onto the surface below, each landing on different locations on the planet. During the crash, the Drake loses an important mechanism, the cosmic drive key. Charlie awakes in a snowy world, where he discovers Yellow Pikmin. However, his side of the story is cut short as he is soon abducted by the Vehemoth Phosbat. After landing in a pool of water, Alph regains consciousness to see a damaged Drake overhead, struggling to land safely. The sight startles him enough to wake him up fully, and he begins exploration of the surrounding area alone. Eventually, he comes across the Red Pikmin and their Onion, and using their help, is able to recover his KopPad and relocate the Drake, which was able to land safely. The cosmic-drive key, held by Olimar. The cosmic-drive key (written as cosmic drive key in Europe) is one of the most valuable parts of the Drake. It is necessary in order to achieve warp-speed, a maneuver needed to go from Koppai to PNF-404 and vice-versa. Warning: the following text contains major spoilers about the ending of Pikmin 3.. When the S.S. Drake crash-lands on the planet, the cosmic-drive key is lost, a fact that becomes clear after Alph finds the ship. During the time it takes the Koppai explorers to travel around, Captain Olimar finds and keeps the key, hoping it is some sort of treasure. Throughout the game's story, both the Koppaites and Olimar mention the key, either by dialog or data files, respectively. After Olimar is captured by the Plasm Wraith and some time after, released from it by the Koppaites, he joins the explorers and hands them the key he found, enabling the group to leave PNF-404 and return to their own planets. Alph: "Oh! There's an incoming transmission from the Drake!" Drake: "Analyzing the recovered plant!" Drake: "Large quantities of Piktamin U detected!" Drake: "This is a seed-bearing fruit, making cultivation on Koppai possible." Drake: "Juice from this fruit is safe for consumption by crew members." Alph: "I'll add a Fruit File to the KopPad, where we can store the results of our analysis." Alph: "But I don't know much about plants at all." Alph: "I'll ask Brittany to write reports later, since she's the botanist." Alph: "We're receiving a transmission from the Drake!" Drake: "An ancient communication device used on this planet." Drake: "It contains technology unknown to Koppai and is emitting a signal even now." Alph: "If I integrate this device into the Drake's communication system, I should be able to boost our signal's strength!" Alph: "Looks like it's going to be an all nighter for me!" The Drake in the background of the Garden of Hope arena. The Drake appears in the background of the Super Smash Bros. for Wii U and Super Smash Bros. Ultimate Pikmin-themed stage Garden of Hope. It doesn't have any other function on the stage other than decoration. It is in the spot where a Waddlepus and a Burgeoning Spiderwort are in Pikmin 3. The S.S. Drake also appears as a trophy in Super Smash Bros. for Nintendo 3DS and Wii U. “While its name might remind you of the famous explorer Sir Francis Drake, this ship is actually named after Alph's grandfather. After the S.S. Drake crash-lands, Alph finds his way back to it and soon gets it working. However, the crew must locate the cosmic-drive key before the vessel can return to Koppai. The vessel is named "Drake" after Alph's grandfather, who was also named Drake. This name seems to have been picked by the developers for a few reasons. At one point during production, there were four main leaders, and their names had not yet been decided. They were given the placeholder names "A", "B", "C" and "D". The first three later ended up being the three Koppaite explorers in the final game, but "Character D" was eventually scrapped. Because the other leaders were given names that start with the same letter as the placeholder names, it is believed that "Drake" was the name that would be picked for the final leader, had he been accepted. Instead of deleting the name, the developers shifted it over to the game's main ship, the S.S. Drake. In addition, the name "Drake" could also be a reference to the famous navigator Sir Francis Drake. This is hinted to by the trophy for the S.S. Drake in Super Smash Bros. for Wii U. Although the navy prefix "S.S" normally means "screw-steamer", a steam-powered ship with a propeller, it can be assumed that this fictional navy prefix means something like "star ship" or "space ship." The S.S. Drake analyzing a Burgeoning Spiderwort berry. The Drake in a landing site, along with the Onion. A damaged Drake flying past Alph as he awakens. Alph looks at the S.S. Drake. The world map menu in Pikmin 3. The S.S. Drake flying low through the Distant Tundra. The S.S. Drake's blue antenna. The S.S. Drake's green antenna. The S.S. Drake's orange antenna. The S.S. Drake in outer space. The interior of the S.S. Drake. The sound made by the S.S. Drake when something sends it hurtling to PNF-404 is very similar to the dog's laugh sound effect in the 1984 Nintendo Entertainment System game Duck Hunt. The S.S. Drake claims that the technology within the Data Glutton is unknown to Koppai, even though the KopPads have radio and video features and the Drake itself can receive the Data Glutton's signal. This could possibly be a mistake. The antenna glows green when after the Data Glutton is obtained, and orange after the Folded Data Glutton is obtained. This page was last edited on March 1, 2019, at 08:55.